It’s the most wonderful time of year and getting that perfect game for your loved one is a pretty great feeling. This year, I’ve broken up my buyers guide into 3 parts. Stocking Stuffers (small, inexpensive games), Family Games (great picks for a wide age range) and Gamer Games (for the board game lover in your life). Check out the list and be sure to share your thoughts or ask questions in the comments at the bottom of the post. Sometimes the smallest games can pack a lot of fun. You don’t have to spend a lot of money to introduce your family and friends to a great game. Whether you’re looking for a stocking stuffer or a great game for your company’s “Secret Santa”, this is a great place to start. All of these games are small, fun and can be purchased for around $15 or less. The game Love Letter is available in lots of different versions including Batman, Adventure Time, the Hobbit, Archer and more. The best part of Love Letter is how easy it is to get players to jump into a game. It only takes 2 or 3 minutes to teach which is great. Players each have 1 card and on your turn, you’re playing a card in hopes of knocking someone else out of the round. The game is quick, light on strategy and great for a mixture of kids and adults. Even when you lose a round, another one is just a couple minutes away. Port Royal is a pirate themed game that a co-worker introduced me to a couple months ago. On your turn you are flipping over cards one at a time to place in the harbor. These cards can be purchased for gold coins that you collect by robbing ships that come into the port. The game is a mix of collecting sets of cards for victory points and press your luck as you flip over the cards on your turn. If you get too greedy, you may just walk away with empty pockets. I love Ladder 29 because it feels like a fresh take on a classic game. If you’ve ever played the game of Rummy, you’ll catch on to Ladder 29 pretty quickly. This recent release from Green Couch Games really made an impact when I previewed the game a couple months ago. Up to 5 players are playing sets and runs of cards that in order to be the first one to extinguish their hand. Hot Spot cards are rules that players have to abide by during that round and make the game a real challenge. The game is so much fun to play with 4 or 5 players! If your family is a fan of classic card games, Ladder 29 is a great buy this season. Our family plays a lot of Fuji Flush! This is one of our daughters’ favorite games. The game is pretty simple and has some fun mechanics that make it 100 times better than the game Uno. Starting with a hand of 6 cards, you’re trying to be the first to flush all your cards. Players can play identical numbered cards to team up with one another or fly solo and make players draw a new card by playing a higher number. It usually takes about 2 turns around the table for everyone to grasp the concept. Once you understand the rules, get ready for trash talk and cards getting smacked down on the table. The game is fantastic with 5 to 8 players and is tamer with only 3 or 4 players. If you don’t already have a copy of Sushi Go in your house, you should remedy that this holiday season. This set collection game features some of the cutest appetizers you’ve ever seen on a card. Each menu item scores points in different ways and you want to score the most points over the course of 3 rounds. After you play a card, you pass the rest of your hand to your left and you receive the hand of cards from the player to your right. This is a great game for both kids and adults. Sushi Go is a great filler that should be a staple on any game shelf. Finding a great game that the whole family can enjoy is so rewarding. Here are a couple great games that can be enjoyed by the whole family. I’ve included some suggested ages and number of players to help you in your buying adventure. There are plenty of bluffing and deduction games on the market but one of our favorites has to be The Chameleon from Big Potato Games. Everyone at the table receives a card and only one of these players will get the chameleon card. Using just one word, players are sharing something about the Secret Word that they all share. “The chameleon” has to also give a single word during the round that doesn’t make everyone else suspicious. The round ends by players throwing around wild accusations and trying to find “the chameleon” at the table. The Chameleon is very similar to a game like Spyfall but we’ve found this one to be more accessible for newer players while still being fun if you’ve played it numerous times. The game plays best with 5 or more players and we’ve found younger players (under 10) struggle with the meaning of some of the words in the game. Tons of people are familiar with the game of Codenames by now. This year, CGE introduced two new versions that carry the Disney and Marvel licenses. The gameplay hasn’t changed but these two editions will definitely draw in fans of both properties. The game is very flexible when it comes to ages because you can either play using words or images. The images will help younger kids get into the action while the words might be a good fit for an older audience. This is a great team game and plays really well with 4 to 10 players. Codenames Disney will actually make an appearance under our Christmas tree this season. You don’t have to be a fan of cars or racing to love the game Downforce from Restoration Games. This remake of Wolfgang Kramer’s 1980 game takes the best this game has to offer and refines them for a modern audience. Players control the 6 different cars on the board with their hand of cards. You get money for finishing the race but also earn money for betting on the placement of cars during the game. This game is so polished and fun for the whole family. With support for up to 6 players, this game hits our table all the time. With a little assistance, this game would be great for player 8 years old and up. Quick gameplay and ease of play makes this a great family game choice! The Quest for El Dorado is a new game from the award winning designer Reiner Knizia. This game was nominated for the Spiel des Jahres award this year and it’s easy to see why. This game is a great introduction to the “deck building” mechanic as your adventurer races to the city of El Dorado. Up to 4 players are trying to get to the end of the board by playing cards from their hand. Players can also buy more powerful cards from the market that will help them travel faster through the jungle. The game is easy to teach, very straight forward and our whole family has enjoyed it. Each time we play this game, we’ve enjoyed it more and more. We’d say this game is a great choice for kids 7+ with a little assistance from an adult due to the text on a couple cards. As a fan of board games, unwrapping another copy of Monopoly can be pretty soul crushing. You may not understand the more complex games but that shouldn’t keep you from gifting a great game this year. Here are a couple “medium weight” games you should look into. If you talk to most board game fans, Pandemic Legacy represented a huge shift in game industry in 2015. Even 2 years later, this game still sits as the number 1 game on BoardGameGeek.com. The game takes place over the course of 12 months and follows the familiar formula from the original Pandemic. The game changes and evolves as you play the game. Depending on whether you win or lose, the map, cards and gameplay changes to introduce twists that keep everyone engaged. If you have a gamer in your life that is ready to dig into this game with friends or family, Pandemic Legacy is a great choice. In October, Z-Man Games published Pandemic Legacy: Season 2 which continues this incredible story. If your loved one has already played the original, Pandemic Legacy: Season 2 would be a great addition to their board game collection. 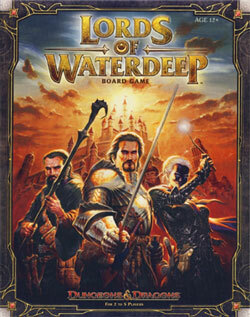 A friend of mine picked up Lords of Waterdeep last year and invited me to play a couple games. With a couple games under my belt, this one is an easy recommendation. This is a worker placement game set in the world of Dungeons & Dragons. You don’t have to be into roleplaying games to really enjoy all this game has to offer. Players are making decisions each round on where they want to place their team. Completing missions will reward you with gold and other perks that will help you win the game. You can even force your opponents to stumble in the game by forcing them to complete mandatory quests that are sure to frustrate even the most calm gamer. Lords of Waterdeep is a lot of fun, not too difficult to teach and offers enough depth to bring the game to the table over and over. Small World from Days of Wonder has been around for almost a decade but it still remains a very accessible medium weight game. Players are trying to gain control of a world that is inhabited by crazy creatures that are controlled by your opponents. You get to pick from up to 14 different races and 20 special powers to dominate the other players. Small World is constantly changing because of the way you pair the races and powers. While this is definitely a game that families will enjoy, gamers will find enough strategy and depth to keep coming back for more I’m adding to this list because it’s a great choice for the gamer in your life and is an easy game to get your hands on. These are only a handful of the amazing games that are available this holiday season. We’d love to hear what games you are giving this season. Post them in the comments below.